Kalamaria (pr. 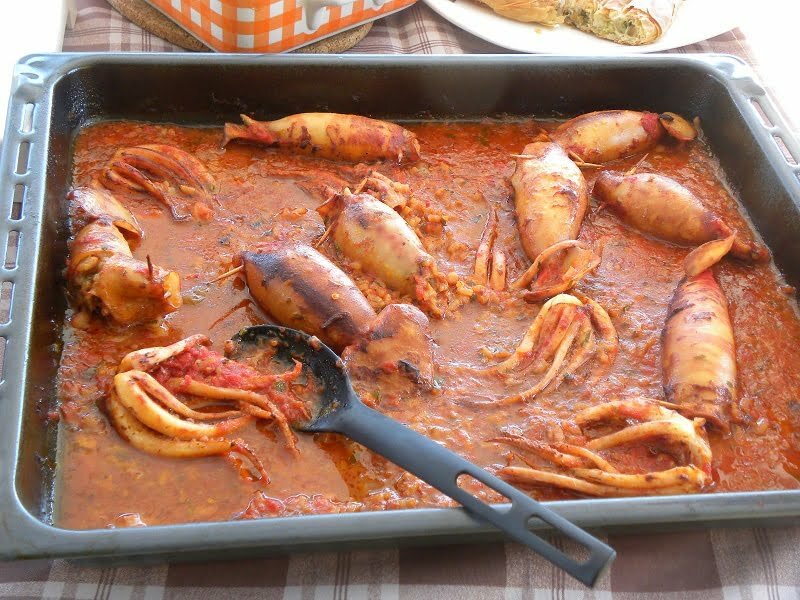 kah-lah-MAHR-ghia), is a very popular dish in Greece and Cyprus, especially during Lent when seafood is allowed to be eaten. Although we can eat all sorts of delicious food during Lent I find it difficult to cook dried legumes or just vegetables on Sundays as Ι have always connected Sunday cooking with meat dishes. During the past weeks I have made kalamari a couple of times, both fried and stuffed, so today I will be posting two recipes. Although I have used fresh kalamari, frozen works just as well but you’ll have to thaw it overnight. If you get fresh kalamari, which we usually do in Greece, you will have to clean it first. The same recipe can be made with “thrapsala” which is the cheaper shortfin squid (Illex coindetti). Fried Kalamari or Calamari (squid) plural kalamaria is a very popular dish, served in all Greek restaurants in Greece and abroad. I remember when I was younger the first times I attempted to make them, they turned out rubbery not to mention the mess in the kitchen when they would burst and oil was scattered everywhere in the kitchen. Thank God those days were over when my sister, who owned a restaurant and now her son has three restaurants in Limassol, visited me in Greece many years ago and explained to me how. In order to cook fried kalamari at home and make it just like the ones you get in a restaurant, there are a few things you should know. First of all you have to let them drain and then cut the body into same size of rings, around 2 cm (3/4 inch) thick. Then coat them in flour. Use all-purpose flour in which add some salt and if you like some pepper. The secret for making kalamari tender is to fry them in plenty of hot oil very quickly. If you have a deep fryer that would make things very easy, otherwise use a deep frying pan in which add about 4 cm (1 1/2 inch) oil. You can fry them in any vegetable oil but I prefer olive oil as it adds to the flavour considerably and it is much healthier. Olive oil is quite expensive so use a small deep frying pan and fry them in batches. Clean and wash the kalamari and drain well for a few hours before frying. Cut the body into 2 cm (3/4 inch) rings leaving the tentacles intact. Mix the salt in the flour and coat the kalamari. Heat the olive oil in a small deep frying pan and fry for 2 minutes. Remove on kitchen paper to drain oil before serving. Stuffed Kalamaria are also one of the dishes I prepare during Lent and although I posted this recipe last year, a lot have changed in the way I cook, so I have changed that recipe by adding more ingredients such as mushrooms and fresh herbs. It tasted heavenly. Clean and wash the squid as follows: Remove the head with the tentacles from the body and with a sharp knife remove the ink sac, eyes and mouth and discard them. See instructions here. From the body, remove the cuttlebone and anything inside. Cut the tentacles and fins in small pieces. Heat 2 tbsp olive oil and sauté the mushrooms. Remove to a platter. Add half of the remaining olive oil in a skillet and sauté the onion until translucent. Add the tentacles and fins and sauté for a few minutes. Add the rice and mix it for a few minutes and add the mushrooms. Add the wine and keep mixing until the alcohol evaporates. Add the raisins as well as 1/3 of the tomato and water and mix. Season with salt and pepper, oregano and savory. Turn off the heat and mix in the parsley and set aside to cool, until the liquid is absorbed. Stuff the squid by 2/3 and secure the opening with a toothpick. Place in a baking tin or Pyrex, season with more salt and pepper and add the remaining tomato, water and olive oil. Any leftover filling can be added in the baking tin. Preheat the oven to 180oC/ 350oF (or 160oC / 325o F, if using a convection oven) and bake for about 50 minutes to 1 hour (depending on their size), turning half way through. Stuffed Thrapsala (Illex coindetti – short fin squids). Kalamaria (Squids) are expensive but there are other alternatives like short fin squids (thrapsala), which are twice cheaper but equally delicious. Using the the freshest seafood and a few ingredients makes all the difference. A minor change I made to this recipe was not to add white dry wine in the rice but added a good Greek red wine (1/2 cup), together roasted garlic, mint, parsley and tomato on top. It produced a more robust flavour, which I prefer and will adopt in the future. I had some leftover filling which I used to stuffed some red onions. I used some red onions that’s why they are so dark. You can see how to prepare the onions here. Both dishes look fantastic! I would gladly take a plate of each! I have only had fried squid and i loved it. Never had the filles ones, would love to have a taste from them as they look so yumm. Forgot to say your pic is really beautiful. The only time I tried Kalamari was in Sydney, & they were yum. You’ve made a neat load of the stuffed ones too Ivy, WOW!! yummy… i love squid. Have you tried Brown Squid? It’s made from soaking dried Squid in lye water (or baking soda with water… that I haven’t have infos). The soaking liquid is changed several times until the dried squid becomes larger than it’s dried form (expanded) and wobbly (due to the lye water.) The soaked squid can be used in cooking and also as salad. Occasionally, I crave for it but I still prefer the fresh calamaris 🙂 Back in my mom’s hometown, they stuffed it with glutinous rice and then cook it in curry or sambal. Pixen, unfortunately I’ve never heard of Brown Squid before but it sounds interesting. The sttuffed squid looks especially delicious. Remind me to tell you of the time I went squid jigging off the coast of the province of Newfoundland and having ink in my hair. The fried kalamarakia…standard – love them and you did them well but your stuffed kalamaria and the pics with the filling exposed…to die for! I would really like to try making squid at home. R isn’t open to it at this point, but I think he would change his tune if I served it to him. Thank you Carole. Happy Easter.